St. Patrick’s Day is a cultural and religious celebration held on 17 March. It marks the traditional death date of Saint Patrick (c. AD 385–461), the foremost patron saint of Ireland. The day commemorates Saint Patrick and the arrival of Christianity in Ireland, and celebrates the heritage and culture of the Irish in general. 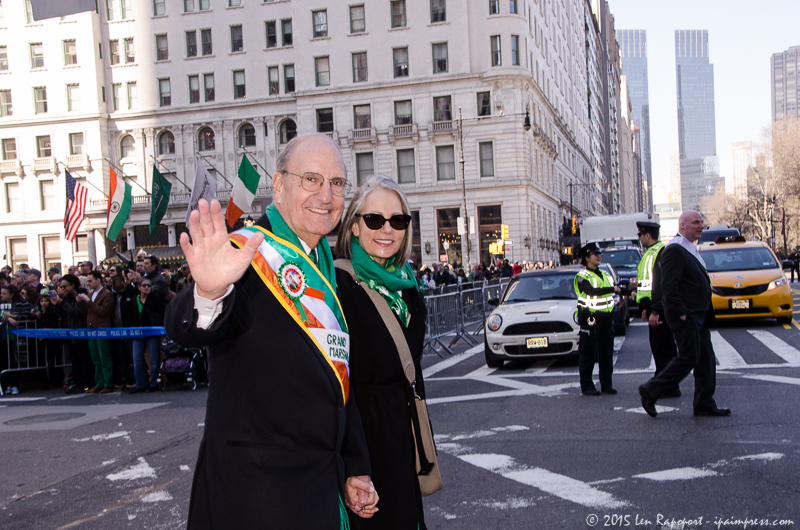 This years Grand Marshal was Senator George J. Mitchell of Maine who has had a remarkable career in public as well as the private sector. He was the one that negotiated the Good Friday Peace Agreement that helped bring peace to Ireland. This year is a special year for a group of people the LGBT that have been left out of the parade in past years. Today the Lavender and Green Alliance was invited to march in the parade under its own banner and “For the first time in decades the whole Irish community will come together to celebrate”, Mayor Bill de Blasio stated during a press conference. Their participation will coincide with the parade’s marking of the 100th anniversary of the Easter Rising, considered to be the birth of Irish Independence. The mayor said he will march with city police and firefighters at the beginning of the parade and march later in the day with the Lavender & Green Alliance. 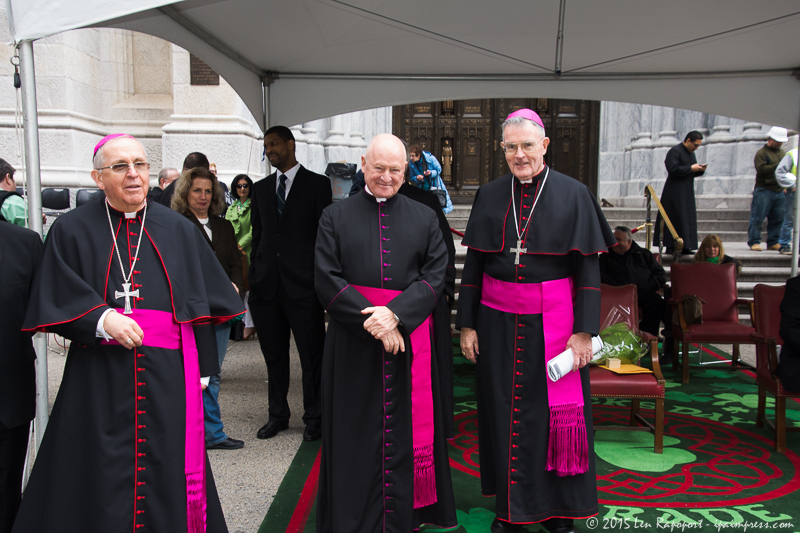 “For the first time in decades, the whole Irish community will come together to celebrate.” he said. Andy Peeke and myself were on the streets early. We wanted enough time to set up for video and for photos and a good spot that offered a nice backdrop for the photos. We decided that the corner of 57th Street would be ideal. A view of Central Park and the beautiful Plaza Hotel. 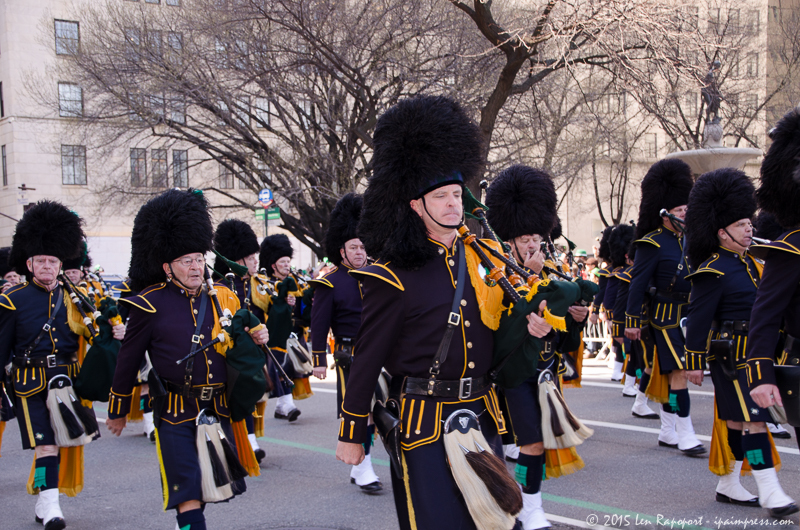 The parade began at 11 a.m. sharp on March 17, when Lieutenant Colonel Sean Flynn, blew the ceremonial whistle to officially started the 255th New York City St. Patrick’s Day Parade. Flynn who commands the First Battalion of the 69th Infantry, New York’s legendary “Fighting Sixty-Ninth.” is a decorated veteran of Iraq and Afghanistan. Since the Regiment was formed in 1851, one or more of Flynn’s ancestors has served with the 69th Infantry in each theater of war in which it has been deployed. The Fighting 69th began the march from 44th Street and Fifth Avenue and was the first in the line of march, as it has been in every New York City St. Patrick’s Day Parade since 1853. 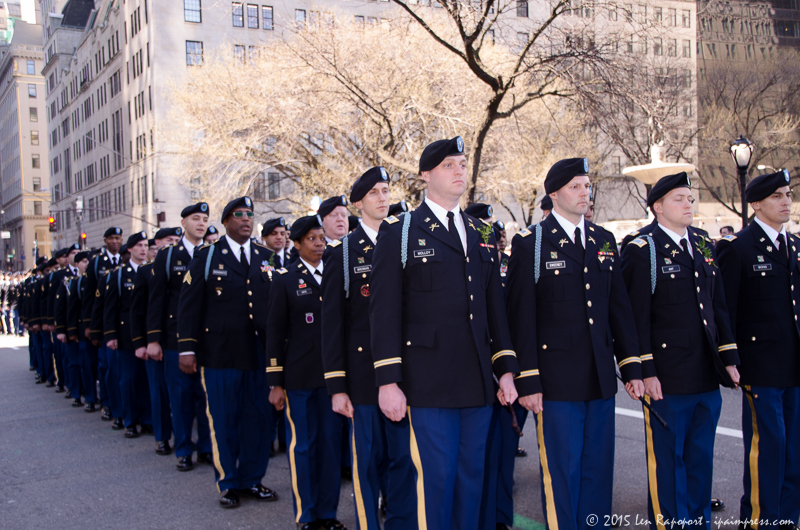 It is estimated that more than 200,000 people were to follow the 69th Infantry up Fifth Avenue’s green line. This is the largest parade in New York City and the marchers are made up of the police, fire department, all branches of the armed services and of course bands and marchers from high schools, Irish societies, dignitaries, elected officials and religious leaders who march proudly and celebrate their Irish heritage. You can download the complete “Line of the March” by clicking this link 2016LoM. This document shows all the groups participating in the parade and the times they will be at various spots in the parade. As the saying goes, “You Don’t Have To Be Irish, To Be Green” and today the hundreds of thousands of people who attended the parade and the millions that have watched its telecast to millions of homes around the world will agree to that simple statement. Even Andy and I wore our green to celebrate this great holiday. The parades formation area was on 44th street, between 5th and Madison Ave. The parade whistles blew at 11:00 AM and the marchers began their march from 44th street and continued up 5th Avenue, past the reviewers stand at 62nd Street and the second Chief reviewing stand at 64th Street. The parade ended on 79th Street. Hundreds of thousands of excited spectators lined the streets, it was a sea of green. We were happy to meet and interview some of the spectators including a couple from Ireland and two “Coleen’s” from Ireland as well. There were a number of staging points on the Parade route, starting at 44th street to the last staging area on 48th street. So we had to position ourselves in various locations along the parade route to get the photos you see here. We started shooting at 57th Street which was a nice open area for our video work. 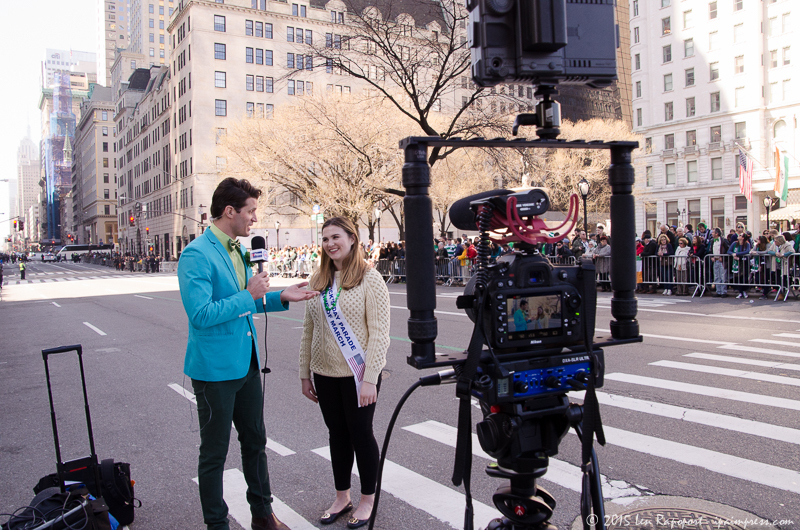 Later in the day we moved down to 53rd Street and walked down to 51st Street past St. Patrick’s Cathedral where we were able to get some photos of the photos of the invited quests of the church. It was a long day and we are still working on our video which will be added to this article soon. Please bookmark this page and come back soon.